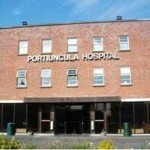 This project commenced in Portiuncula Hospital, Ballinasloe for the HSE West in September. The works involve internal demolitions & alterations of the old A&E area & the subsequent fit-out of a new A&E Department with full facilities ie, Resus Area, Assessment Bays, Treatment Areas, Plaster / Procedure Room, Consultants Rooms etc. A new entrance lobby is also being constructed along with associated external works.